Antonio Conte has refuse to rule out move away from Stamford Bridge. 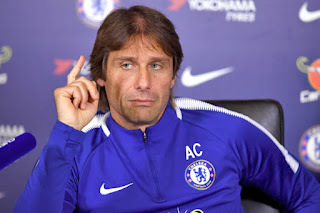 In a recent interview Conte was asked if he would be leaving the London club this summer, He replied: "I have another year of contract at this club, but as you know in football Everything is Possible." "In one moment you stay here, another you stay in a different place." Antonio Conte was also asked he if he would renew his contract, He said: "In that case, I think the club has to decide to send me away." "For the manager of this club it's normal to have this type of situation, also if you won last season the league and you reached the final in the FA Cup. This is the history of this club for the manager." "I have a lot of experience to deal with this type of situation. There is something strange if, after the first game we lost against Burnley, the press pushed quickly to sack me for another coach. I think in other clubs this doesn't happen." The Chelsea Boss also insisted he is happy at the club and he will continue to work as a professional and will never give up.